Rahgot is a high-ranked dragon priest whose sarcophagus is in Forelhost, on the mountain peak south-southeast of Riften. He wields a dragon priest staff, and carries his eponymous mask. Rahgot led the last remnants of the Dragon Cult until a legion of King Harald's soldiers discovered his hidden stronghold. 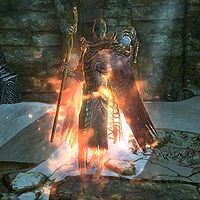 Rahgot knows the following spells: Greater Ward, Conjure Flame Atronach, Fireball, Ebonyflesh, Command Daedra, Incinerate, and Flame Cloak. This page was last modified on 3 March 2017, at 14:23.